The pyramids and the Great Sphinx rise inexplicably from the desert at Giza, relics of a vanished culture. They dwarf the approaching sprawl of modern Cairo, a city of 16 million. The largest pyramid, built for the Pharaoh Khufu around 2530 B.C. and intended to last an eternity, was until early in the twentieth century the biggest building on the planet. To raise it, laborers moved into position six and a half million tons of stone—some in blocks as large as nine tons—with nothing but wood and rope. During the last 4,500 years, the pyramids have drawn every kind of admiration and interest, ranging in ancient times from religious worship to grave robbery, and, in the modern era, from New-Age claims for healing "pyramid power" to pseudoscientific searches by "fantastic archaeologists" seeking hidden chambers or signs of alien visitations to Earth. As feats of engineering or testaments to the decades-long labor of tens of thousands, they have awed even the most sober observers. The question of who labored to build them, and why, has long been part of their fascination. Rooted firmly in the popular imagination is the idea that the pyramids were built by slaves serving a merciless pharaoh. This notion of a vast slave class in Egypt originated in Judeo-Christian tradition and has been popularized by Hollywood productions like Cecil B. De Mille's The Ten Commandments, in which a captive people labor in the scorching sun beneath the whips of pharaoh's overseers. But graffiti from inside the Giza monuments themselves have long suggested something very different. Until recently, however, the fabulous art and gold treasures of pharaohs like Tutankhamen have overshadowed the efforts of scientific archaeologists to understand how human forces—perhaps all levels of Egyptian society—were mobilized to enable the construction of the pyramids. Now, drawing on diverse strands of evidence, from geological history to analysis of living arrangements, bread-making technology, and animal remains, Egyptologist Mark Lehner, an associate of Harvard's Semitic Museum, is beginning to fashion an answer. He has found the city of the pyramid builders. They were not slaves. "I first went to Egypt as a year-abroad student in 1973," he says, "...and ended up staying for 13 years." His way was paid by a foundation that believed a hall of records would be found beneath the paws of the Sphinx. Young Lehner, a minister's son from North Dakota, hoped to discover if that was true. But the more time he spent actually studying the Sphinx, the more he became convinced that the quest was misguided, and he exchanged its fantasies for a life grounded in archaeological study of the Giza plateau and its monuments. Actually, he became, in the words of one employer, an "archaeological bum" who soon found work all over Egypt with German, French, Egyptian, British, and American expeditions. "At the end of these digs, there were lots of maps and drawings left to be done," he adds—steady work once the short dig season was over. Lehner discovered he had a knack for drafting, and got his first lessons in mapping and technical drawing from a German expert. "I fell in love with it," he confesses. His first big break came in 1977, when the Stanford Research Institute conducted a remote sensing project at the Sphinx and the pyramids— a search for cavities using non-invasive technologies. The Sphinx is carved directly from the sedimentary rock at Giza, and sits below the surface of the surrounding plateau. Lehner was put in charge of a group of men cleaning out the U-shaped, cut-rock ditch that surrounds the monument, so that the sensing equipment could be brought in. In order to plot the locations of any anomalies, the largest existing surface maps of the Sphinx—about the length of an index finger—were enlarged and found to be extremely inaccurate. By then a seasoned mapper, Lehner asked the director of the American Research Center in Egypt (ARCE, a consortium of institutions including museums and universities such as Harvard) if they would sponsor his effort to map the Sphinx. But Lehner, despite his experience in the field, didn't have a Ph.D. Running his own "dig" appeared to be out of the question until ARCE assistant director James Allen, an Egyptologist from the University of Chicago, essentially adopted Lehner professionally, took him under the wing of his own Ph.D., and designed a mapping project. The German Archaeological Institute loaned photogrammetric equipment, the sort used by highway departments for taking highly accurate stereoscopic photographs from the air, and Lehner soon produced the first scale drawings of the Sphinx, which are now on display at the Semitic Museum. During the mapping, Lehner's close scrutiny of the Sphinx's worn and patched surface led him to wonder what archaeological secrets it might divulge. "There are layers of restoration masonry going back all the way to pharaonic times," he says, indicating that even then, "the Sphinx was severely weathered." What Lehner saw, in essence, was an archaeological site, in plain view, that had never been described. To better understand the differential weathering in the natural layers of rock from which the Sphinx is cut, Lehner initially consulted a geologist with expertise in stone conservation. Then his interest in the geological forces that created the Giza plateau brought him into contact with a young geologist, Thomas Aigner, of the University of Tübingen, who was studying the local cycles of sedimentation. The layers in the lower slope of the plateau, where the Sphinx lies, tend to alternate between soft and hard rock. The softer layers of rock were deposited during geological eras when the area was a backwater lagoon protected by a coastal reef; they are highly vulnerable to erosion. Aigner pointed out to Lehner that the "hard-soft" sequence of layers in this part of the plateau would have made it easy for ancient stonecutters to extract blocks of stone for building. His analysis revealed that the stones used to build the temples in front of the Sphinx had been quarried from the ditch that surrounds it on three sides. Many of these huge blocks, some of them weighing in at hundreds of tons, are so big that they have two or three different geological layers running through them, and they are loaded with forminifera. Detailed logs of the fossils—gastropods, bivalves, sponges, and corals—in each block and layer allowed Lehner and Aigner to actually trace the stones back to the quarry. 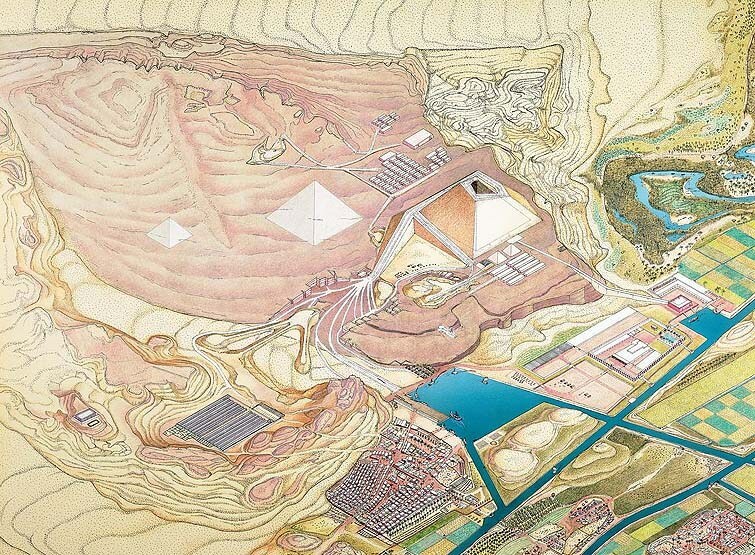 "We began to unbuild these temples in our minds," Lehner explains, "and realized that the same could be done for the pyramids themselves and for the whole Giza plateau." Lehner had often imagined what Khufu's architect must have envisioned when he looked down from the Maadi formation knoll high above the southeast slope of the plateau and planned the very first pyramid: quarries, a port for bringing in exotic materials like granite and gypsum mortar, a place for the workers to live, provisions for their food, a delivery route from the port to the construction sites. The ancient Egyptians, having already quarried materials for other pyramids for generations, "probably were good geologists in their own right," says Lehner. They knew how to line up all three of the massive examples at Giza precisely on the strike of the plateau's slope (if you can walk around a hill without going either up or down the slope, you are on the strike). In consequence, all the pyramids—which align on their southeast corners—begin at nearly the same elevation. Most modern scholars think they were built with ramps: the crumbling stone chips from the Mokattam formation quarries were close by and may well have provided the secondary material for the ramps. "This was one of the many insights given us by the geologists," Lehner says. Yet almost nothing of the infrastructure needed to build a pyramid, with the exception of the quarries, had ever been located. Lehner went back to the ARCE. Why not map the whole plateau, he asked, to see what the land itself could tell about how ancient Egyptian society organized itself around the task of large-scale pyramid building? Studying the geology of an archaeological site is standard practice today, but it had barely been done for Giza, Lehner says, because "Egyptology grew up in the study of inscriptions." When Jean-François Champollion deciphered hieroglyphics in 1822, "suddenly huge temple façades and tombs everywhere started 'talking' to explorers." Then came the overwhelming abundance of "fabulous art objects—fabulous in their own right," he says, "but less useful out of context than they would have been if properly documented. Egyptology grew up largely as a philological and art historical discipline. Archaeology as a standard practice was late to come to Egypt." Over several seasons, Lehner surveyed the plateau to an accuracy of within a millimeter, and began to see with greater certainty how the pyramid builders had arranged themselves across the landscape. An ancient wadi—a desert streambed that flows with water only during the occasional downpour—would have made a perfect harbor, he surmised. The locations of the stone quarries, down the slope from the pyramids themselves, were known, and he thought he knew where a city of pyramid builders might fit into this pattern. What began to interest Lehner more than the question of how the Egyptians built the pyramids was, he says, "how the pyramids built Egypt." Construction of the immense Giza monuments, thought to have been built for three successive pharaohs in a kind of experimental gigantism, must have required a lot of "free-wheeling" on the existing social apparatus. Influenced by Cambridge University's Barry Kemp, who wrote Ancient Egypt: Anatomy of a Civilization, Lehner came to believe that the colossal marshaling of resources required to build the three pyramids at Giza—which dwarf all other pyramids before or since—must have shaped the civilization itself. By now, Lehner was in his early thirties and realized that continuing his career hinged on getting a Ph.D. From 1986 to 1990, he suspended fieldwork to study at Yale under William Kelly Simpson. In his final year, with an offer of funding for what, he says, "had been jelling in my mind" for some time, he designed his "dream project": to find and excavate the settlement of workers who had built the pyramids. His studies had given him an idea of what he should be looking for—a city of about 20,000 people, on a scale with the earliest major urban centers of Mesopotamia, such as Ur and Uruk. In other words, he was looking for one of the most important cities of the third millennium B.C. Lehner let the geology of the plateau guide his search. Guessing at the location of the harbor, he surmised where the delivery route to the pyramids must have run. Logically, the settlement for workers should be to the south-southeast, he thought, and in fact, at precisely that location, at the mouth of the wadi that divides the plateau, a towering stone wall, called in Arabic "the wall of the crow," loomed above the sand. In Lehner's home state of North Dakota, he says, the ancient masonry would have drawn attention and eventually been designated a national monument. But in Egypt, with its hieroglyphics, "gold bowls, and mummies," the wall was virtually ignored. But not completely. Harvard professor of Egyptology George Reisner, an early promoter of stratigraphic digging in Egypt, had noted the massive stone blocks in this wall almost in passing in the early twentieth century; he even stated that there was probably a "pyramid city" beyond it. But Lehner thinks that even the methodical Reisner, who unearthed much of the extraordinary Egyptian collection at Boston's Museum of Fine Arts, was burdened by the magnitude of material coming out of the excavations he had undertaken. The manner of the discovery of the tomb of Queen Hetepheres is a perfect illustration. Reisner was actually in the United States when his photographer, setting up the legs of his tripod, inadvertently punched through the desert sand into a buried shaft leading to a hidden chamber filled with grave goods. The contents of the chamber had been disassembled in antiquity, and Reisner painstakingly reconstructed them: a golden chair, a golden bed with a headrest—furniture from the boudoir of the queen. Lehner found himself facing a different kind of obstacle altogether. Now that he had his Ph.D., his nascent career as a scholar began to limit his time for fieldwork. He had accepted a tenure-track position at the University of Chicago's Oriental Institute, just when a massive modern sewage project for Greater Cairo had begun to expose the very area where Lehner planned to search for his ancient city. For the most part, the bakeries duplicate, many times over, the same process by which bread was made in any Egyptian household of the time. Egyptologists might be mistaken, says Lehner, to think of pyramid building as analogous to a 1930s WPA project. "You don't just cross this threshold around 3000 B.C." and have state projects with economies of scale, he argues. That would take another 1,500 years to develop. Instead, he says, the bakeries—and by extension, probably these "first skyscrapers"—"were built by replicating a household mode of production." But some evidence found at the bakery site did suggest that a cultural evolution might have begun: the pots, or bedja, would have made a conical loaf more than a foot long. Lehner says the Egyptians appear to have been reaching, even at this early phase in the process of state formation, for some economies of scale. An adjacent chamber turned out to be a hypostyle, or pillared hall, the oldest ever discovered in Egypt, filled with low benches. Speculation about how it was used suggested a dining hall, but its likely purpose remained a mystery for several years. Lehner, in the meantime, gave up his professorship at Chicago to dedicate himself to the excavation of the pyramid city. In October 1999, with funding from philanthropists Ann Lurie, Peter Norton, David Koch, and others, he launched a "millennium project" to uncover the pyramid city through a consolidated effort of excavating eight months a year for each of the subsequent three years. Lehner believes the city was intentionally razed and erosion then swept away the rubble before the sand blew in. Today, all across the site, the ruins stand only ankle to waist high. Lehner brought in trucks and front-end loaders to remove the overburden of sand that had preserved the site. "We now have an exposure of about five hectares, and have mapped the city over the whole area," he says. His international team of 30 archaeologists has excavated 10 percent—or 5,000 square meters—intensively, a huge undertaking when using modern stratigraphic standards. With more than 100 workers in total, they have amassed the largest collection of material culture from any dig anywhere in Egypt. They have found not one town, but two, side by side. The first is laid out in an organic fashion, as though it grew slowly over time. Lehner speculates that this was the settlement for permanent workers. The other town, laid out in blocks of long galleries separated by streets, on a formal, grid-like system, is bounded to the northwest by the great wall that both Lehner, and Reisner before him, had noted. This "wall of the crow" turned out to be massive indeed, 30 feet high, with a gateway soaring to 21 feet, one of the largest in the ancient world. The main street leading through the complex is hard-packed limestone, paved with mud, with a gravel-lined drain running down the center—engineered, says Lehner, "almost like a modern street." His team has partially excavated a royal building filled with hundreds of seals dating from the time of Khufu's son, Khafre, and his grandson, Menkaure. And they have found a royal storehouse with circular grain bins just like those depicted in De Mille's The Ten Commandments. But there was something missing. There were not enough houses for all the people. Generations of scholars have painstakingly calculated how many laborers would have been needed to quarry, transport, and position the stones of the great pyramids. Estimates have ranged widely—from the 100,000 cited by Herodotus to just the few thousand posited by recent assessments that allow for decades of construction time. Yet Lehner and his team were not finding enough houses to accommodate even the low-end estimates. "Where are all the people?" he wondered. His graduate studies had taught him how other scholars of Middle Eastern settlement patterns had analyzed sites in order to come up with estimates of population size. Lehner was approaching the problem from the opposite perspective. He had a sense of how many people were needed to build a pyramid, and so could infer the size of the city he would find. But there were too few dwellings. The city seemed a ghost town. Everywhere, Lehner and his team turned up institutional-looking buildings. One was used for working copper—the hardest metal known to the ancient Egyptians, and critical for quarrying and dressing stones. On the floor of another, the excavators found what at first looked like ears of wheat, suggesting another bakery. But these turned out to be fish gills. The site was littered with them, and with fish fins and cranial parts; it turned out to be a place for processing or consuming fish. For a city with few residents, someone seemed to be eating a lot of loaves and fishes. Because there were just 40 galleries in four large blocks in the entire area, Lehner was sufficiently disturbed that he called in his friend Barry Kemp, the world's foremost authority on ancient Egyptian urbanism, to have a look. "Looks alien," teased Kemp, when Lehner asked him what he made of the large, sprawling galleries. In fact, Kemp believed and Lehner agreed that each gallery included the elements of a typical Egyptian house—a pillared, more public area, a domicile, and a rear cooking area—stretched out and replicated on a massive scale. The surprises were just beginning. Faunal analyst Richard Redding, of the University of Michigan Museum of Natural History, identified tremendous quantities of cattle, sheep, and goat bone, "enough to feed several thousand people, even if they ate meat every day," Lehner adds. Redding, who has worked at archaeological sites all over the Middle East, "was astounded by the amount of cattle bone he was finding," says Lehner. He could identify much of it as "young, under two years of age, and it tended to be male." Here was evidence of many people—presumably not slaves or common laborers, but skilled workers—feasting on prime beef, the best meat available. Redding and Wilma Wetterstrom had worked at another site in Egypt where cattle appeared to have been raised on a kind of estate. Wetterstrom had found tremendous quantities of clover plant remains that had been eaten by cattle, yet Redding "had found very little cattle bone," Lehner notes. "We know from historical sources that the Egyptians were trying to colonize their hinterland during this very period," and Redding had hypothesized that cattle were raised at the estate and shipped to somewhere near the capital or near the pyramids at Giza. At Giza, the amount of cattle bone that Redding found suggested that the city site uncovered by Lehner and his team was "downtown Egypt," and that farms and ranches along the frontier could have been feeding the pyramid builders at the society's core. Redding's faunal evidence dealt a serious blow to the Hollywood version of pyramid building, with Charlton Heston as Moses intoning, "Pharaoh, let my people go!" There were slaves in Egypt, says Lehner, but the discovery that pyramid workers were fed like royalty buttresses other evidence that they were not slaves at all, at least in the modern sense of the word. Harvard's George Reisner found workers' graffiti early in the twentieth century that revealed that the pyramid builders were organized into labor units with names like "Friends of Khufu" or "Drunkards of Menkaure." Within these units were five divisions (their roles still unknown)—the same groupings, according to papyrus scrolls of a later period, that served in the pyramid temples. We do know, Lehner says, that service in these temples was rendered by a special class of people on a rotating basis determined by those five divisions. Many Egyptologists therefore subscribe to the hypothesis that the pyramids were also built by a rotating labor force in a modular, team-based kind of organization. If not slaves, then who were these workers? Lehner's friend Zahi Hawass, secretary general of the Supreme Council of Antiquities, who has been excavating a "workers' cemetery" just above Lehner's city on the plateau, sees forensic evidence in the remains of those buried there that pyramid building was hazardous business. Why would anyone choose to perform such hard labor? The answer, says Lehner, lies in understanding obligatory labor in the premodern world. "People were not atomized, separate, individuals with the political and economic freedom that we take for granted. Obligatory labor ranges from slavery all the way to, say, the Amish, where you have elders and a strong sense of community obligations, and a barn raising is a religious event and a feasting event. If you are a young man in a traditional setting like that, you may not have a choice." Plug that into the pyramid context, says Lehner, "and you have to say, 'This is a hell of a barn!'" Lehner currently thinks Egyptian society was organized somewhat like a feudal system, in which almost everyone owed service to a lord. The Egyptians called this "bak." Everybody owed bak of some kind to people above them in the social hierarchy. "But it doesn't really work as a word for slavery," he says. "Even the highest officials owed bak." Slaves or not, as the last season of his dig began, Lehner still did not know where all the workers slept. With his household model in mind, he had been looking for large "manor houses" where lords could board their laborers for the pharoah. Instead, he had found whole blocks, 170 meters long, of "precocious, sleek, modern-looking nondomestic galleries, albeit with elements of a typical Egyptian home." Gradually, his team has developed a hypothesis for how these facilities were used. "We now see the enigmatic rows of long galleries...," wrote Lehner at the end of the 2002 season, "as barracks housing for a rotating labor force, perhaps as large as 1,600 to 2,000 workers." This is why there are scores of bakeries flanking the galleries, as well as an abundance of bone. If the next few years of documentation, publication, and peer review bear him out, Lehner's findings will suggest that the ancient Egyptians were even more advanced in their social organization at this period than previously supposed. Perhaps the Old Kingdom's pharaohs did indeed preside over something more like a nation than a fiefdom. What was arguably humanity's first great civilization may have been even greater, at an earlier date, than we have ever supposed. The latest article by author Jonathan Shaw '89, explains how new plant technologies could simultaneously feed the planet at peak population and save the environment in a new Green Revolution.